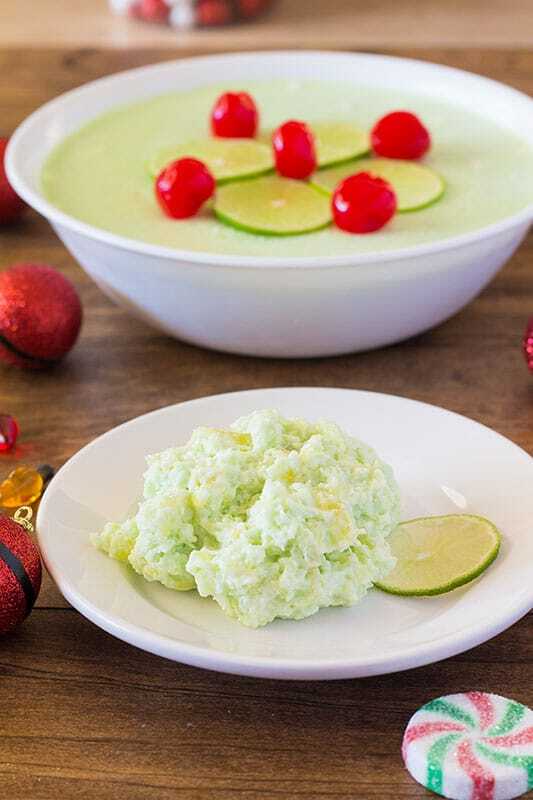 Holiday Green Jello Salad is a creamy lime Jello Salad mixed with pineapples and cream cheese. 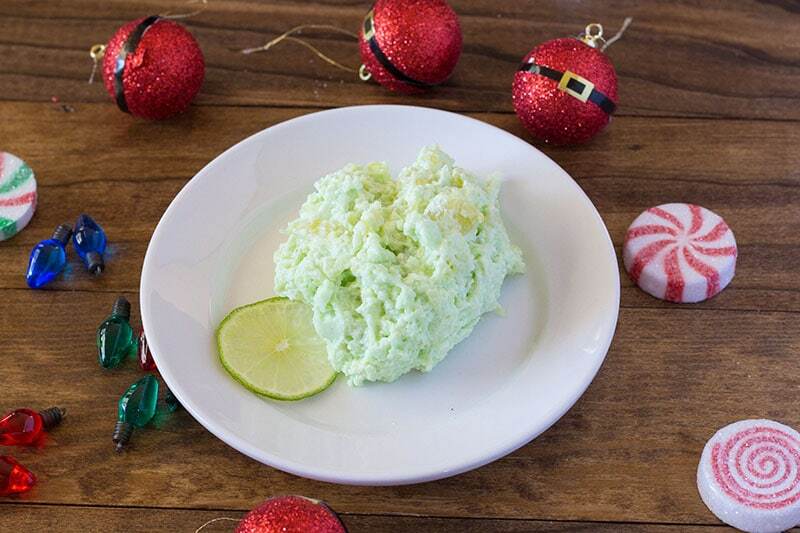 Green salad was at every holiday meal my mom was involved in. I can’t remember a holiday at her house, or anyone else’s for that matter where this dish wasn’t present. She loved green salad and if no one else was making it, you were guaranteed she would. 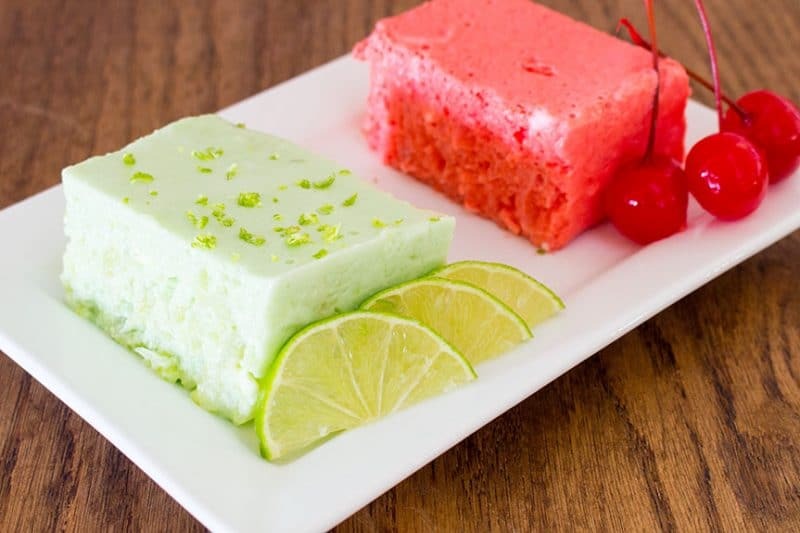 It had never been any other color until her later years when she started substituting cranberry or cherry jello for the lime. When I was younger I preferred mine with pecans in it, and surprise cream cheese chunks that didn’t completely dissolve into the mix. Now I am a puritan in the nut arena. I also prefer to eat this made with cranberry jello, and cherry is a close second. I don’t make this in my kitchen anymore. It was more of a tradition at my house rather than a “craving” for me, you know, one of those things that you were expected to put on your plate but kind of pushed around. However, this is now a part of Ron’s holiday traditions so it should be his cookbook version that appears in this post. This is not a dish he pushes around his plate. He loves it! Ok, so I lied. My grandmother cooked one other thing besides biscuits and gravy and tacos. Don’t let the name fool you. This is not a normal salad, but a green Jell-O-like salad to eat on the side during lunch or dinner. My grandmother frequently made this for me during Thanksgiving and Christmas dinners. That’s the only time I like to eat this salad. However, this was usually the highlight of my Thanksgiving meal. This recipe was handed down from my grandma, then to my mom, to me. This recipe is great during the fall and winter holidays. My grandma traditionally did not use the Maraschino cherries, but they can be a fun mix. I have also seen a recipe before where pecans can be added to the mix. This side is amazing with a traditional Christmas ham. I love to slather this all over the ham and eat it until I’m sick. 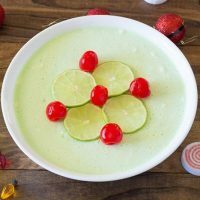 Vintage Jello Salad recipe using Jello, marshmallows, pineapple, cream cheese and whipped topping. Heat milk and marshmallows in a sauce pan over low heat until the marshmallows are almost melted. 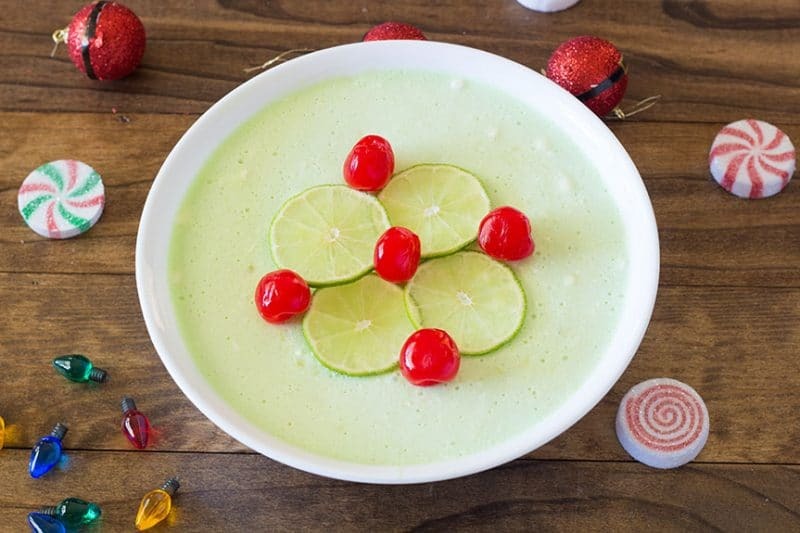 In a large mixing bowl, add the lime Jello package. Pour the warm milk and marshmallow mixture over the Jello powder. Mix well and allow to cool slightly. Add the cream cheese and mix with a whisk or hand-mixer until small bits of cream cheese are all that is left. Add the pineapple, juice and all. Optional, add Maraschino cherries. Add whipped cream and mayo. Add pecans now, if using. Place into a container of choice. Place into refrigerator until firm. Whipped topping can be substituted for whipped cream. It gets added with the whipped cream. I’m sorry you didn’t see it. I have checked the recipe card and it is listed in step 7. I don’t see the mayo that’s listed in the ingredients in the directions that follow. Is mayo part of this recipe? I’m making it now and will omit, but curious if it’s needed. This has been served at holiday meals in my family as long as I can remember! If you give it a try, let us know how you liked it! I never thought to put all that together – with cream cheese and mayo and dream whip – wow! What an interesting combo. May have to give this one a try! Yum!